Air Supply Heating & Air Conditioning caters to the commercial businesses and residential homes of the Greater Las Vegas, NV area. We are fully licensed and insured to deliver fast, friendly, and efficient services. 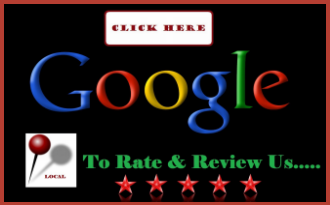 Air Supply Heating & Air Conditioning technicians are experienced, masterfully trained experts. As we extend family-friendly customer service, high moral, standards, and superior execution on all services rendered, you like so many, we happily call on us for your HVAC system needs as we supply our valued customers with full HVAC system services. 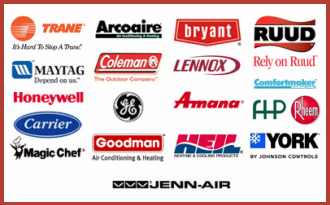 Air Supply Heating & Air Conditioning utilizes high-end equipment, tools, and products to execute premium results. 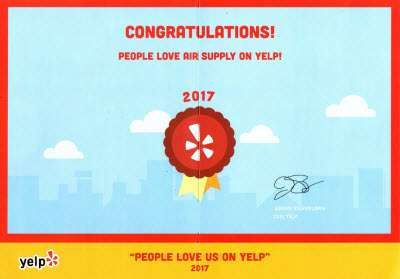 Air Supply Heating & Air Conditioning knows that commercial businesses in the Las Vegas, NV Valley rely on their air conditioning units to maintain a comfortable temperature when the scorching Vegas desert summer is upon the locals. Without a sufficiently operating air conditioning unit, the escape people need inside is essential for survival. Customers won’t stay long and staff member’s production will be low and temperaments tend to get grumpy. That is why it is extremely important that commercial business owners consider getting their air conditioning units tuned up annually. Like any modern convenience, those featuring moving parts and technical application need a regular tune up to maximize performance, prevent major breakdowns, reduce minor issues from occurring, and extend the longevity. Air Supply Heating & Air Conditioning offer commercial air conditioning maintenance service in an effort to help you do just that. Our comprehensive commercial air conditioning unit tune up is meticulous and precise to cover all the parts, components, and inner workings to ensure your air conditioning unit is working at peak performance, is energy efficient, and to intervene if any problems are amiss. Your commercial air conditioning unit in Las Vegas, NV and surrounding areas is properly cared for during Air Supply Heating & Air Conditioning commercial air conditioning unit tune up service; our tune up consists of, but is not limited to the list found below. –	Inspection of all wires for signs of fraying or poor installation and capacitor output. Ensure all electrical connections are tightened. –	From the thermostat, the unit is cycled to ensure efficiency. –	Fan blades are checked for proper function and are wiped down. –	Refrigerant lines and pressure are inspected and checked for possible leaks. –	Condenser coils are inspected. –	Condensate trap is checked and cleaned. –	Drain pan and cabinet is thoroughly cleaned. –	Blower belt is checked for durability. –	All needed moving parts are lubricated accordingly. –	System’s voltage and amp draw are thoroughly looked over. –	Air filters are cleans and/or replaced. 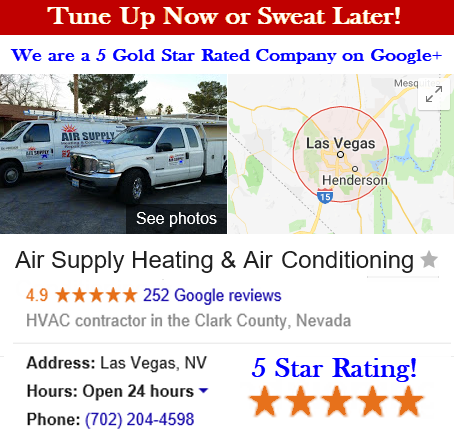 Air Supply Heating & Air Conditioning recommends getting your Las Vegas, NV Valley commercial air conditioner tuned up annually, most optimally just before air conditioning season or after. Doing so will better care for your air conditioner unit’s energy efficiency, performance, and durability for years to come. Call us today to schedule your appointment!